Sitting on a site facing the Straits of Johor, Kandis Residences offers a waterfront living experience that is far away from the crowds and the stresses of living in the city. 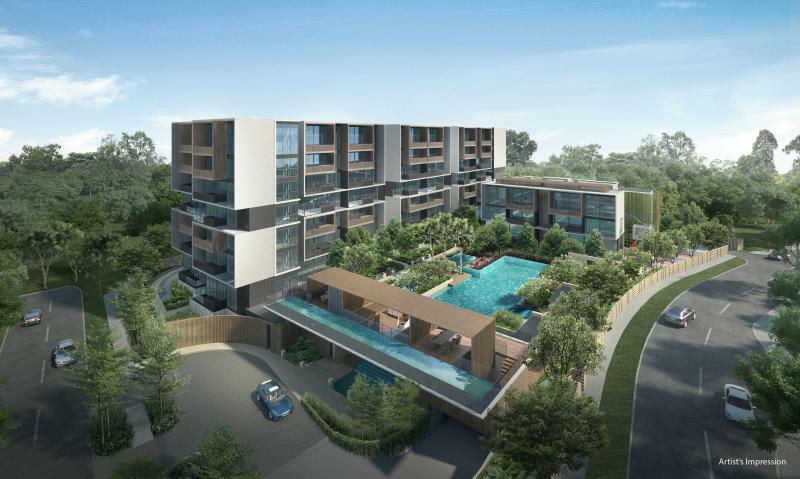 Situated next to a private landed residential housing estate and within walking distance to Sembawang Park, Kandis Residences Singapore is set in a tranquil environment, ideal if you love the peace and quiet living experience that it offers. The Sembawang Park nearby is a popular place for family and friends to get together to enjoy the beautiful beach side and views of the Straits of Johor. It is also a popular fishing ground and one of the few remaining natural beaches in Singapore. Sembawang Park is also a place rich with history as you will be able to know more about Singapore’s naval heritage from colonial times. Kandis Residences condo is also located near to Water-Venture Centre (Sembawang), which offers many different water sports in an environment far away from the concrete jungle prevalent throughout Singapore. Engage in activities such as kayaking or take part in trail walks at the facility, which makes an exciting outdoor destination for you and your family. With a maximum building height of 3 and 7 storeys, Kandis Residences will be a low-density development of approximately 115 housing units sitting on a site of 7,046.8 m2. Once completed, it will be a small community within the gated residential development and you will be able to form close ties with your neighbours. Jalan Kandis is connected to the Sembawang MRT station on the North-South Line, where you will be able to get to the Orchard Road shopping belt in 25 minutes, via a bus service that stops within a few minutes walk from the development. Kandis Residences is also a short 15 minutes drive from Woodlands Checkpoint, ideal if you or your family members need to travel to and fro Johor Bahru frequently. Otherwise, spend your many weekends café hopping at the many cafés across the Causeway. Jalan Kandis is connected to the SLE, which will connect you to the TPE towards the east or CTE towards the south, via Sembawang Road. Furthermore, the upcoming North-South Expressway will help improve existing connectivity in the area, and offer you a direct route to the city, saving you up to 30% travel time to the city. 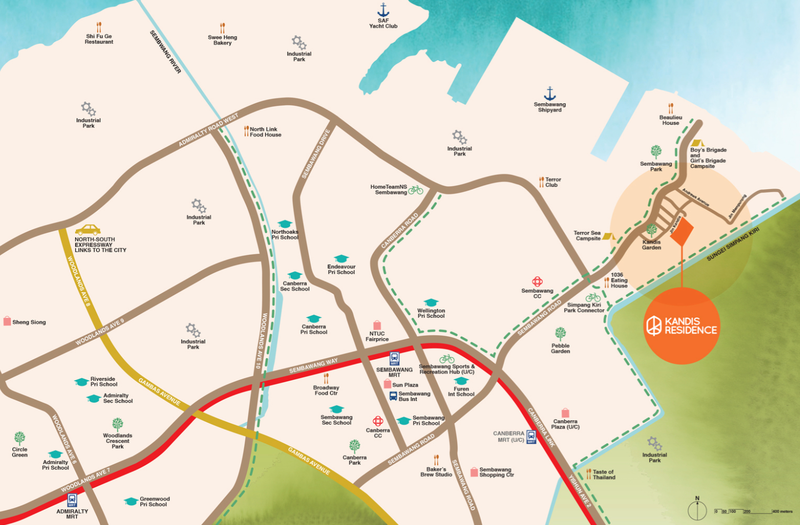 The arterial roads, Sembawang Road and Yishun Avenue 2 also connect you to other major roads that can help you to travel to anywhere in Singapore. According to the URA Master Plan 2014, more employment opportunities will also be brought into the northern part of Singapore, with new industrial developments along Gambas Avenue, the development of Woodlands Regional Centre as well as the North Coast Wafer Fab Park. A home in Kandis Residences is ideal especially if you work in the northern part of Singapore. Avid cyclists will also be pleased to know that Jalan Kandis Tuan Sing is just a short distance away from the Canberra-Sembawang Park Connector, which not only is part of the Round Island Route, but also provides you an alternative mode of transport to the upcoming Canberra MRT Station. You will also be able to cycle directly to Yishun MRT Station, where you will be able to find Northpoint Shopping Centre and future Northpoint City right across the road from the MRT station. When fully developed, Northpoint City will be integrated with the existing Northpoint Shopping Centre, which together will offer more than 500 retail and dining options. The development will also include a childcare centre, a roof-top community garden, the Yishun Public Library, children’s play area, a Town Plaza the size of 10 basketball courts, and the Nee Soon Central Community Club, offering you a one-stop destination for your various needs. With such a development, there is no need for you to travel far out from your home at Kandis Residences to be able to meet all your daily needs. Your daily necessities can be conveniently found in Sun Plaza or Sembawang Shopping Centre, both a short drive away. Food lovers will also be delighted to explore the variety of traditional coffee shops and cafés along Sembawang Road. There are also plans for a new hawker centre to be built next to Admiralty MRT station. Alternatively, the Woodlands Regional Centre a few MRT stops away also offers you a many different options for shopping, entertainment and dining. There is also a regional library at Woodlands Regional Centre for book lovers. You will also be able to get to Orchid Country Club, Seletar Country Club and Sembawang Golf Course easily, which are all a short drive away from Jalan Kandis. Bring your family out for some family bonding time at one of the bowling alleys within the clubs, or enjoy a game of golf with your golf ‘kakis’ or business partners. If you are looking for a tranquil and peaceful living environment to live in, Kandis Residences is ideal for you. With a home in Kandis Residences, you will be able to stay far away form the hustle and bustle prevalent in most of Singapore. 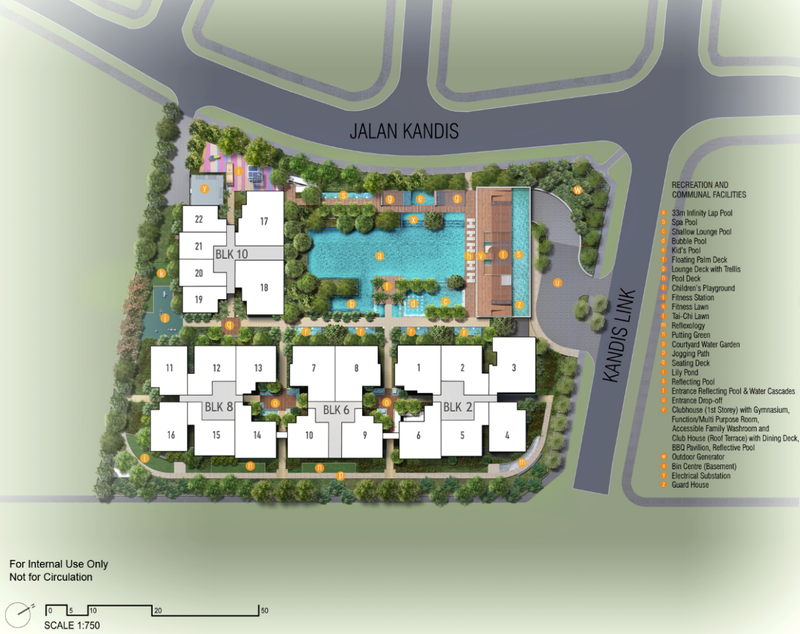 Enquire now to start building your sanctuary at Kandis Residences. For more information on Kandis Residences, simply fill up your details below and our salesperson will get in touch with you shortly!